The unfettered imagination of Terry Gilliam (Brazil, Twelve Monkeys) is on full display in The Imaginarium of Dr. Parnassus, an endlessly playful movie that contains Heath Ledger's final performance. (Johnny Depp, Jude Law, and Colin Farrell were brought in after Ledger's death to complete and amplify his role). Christopher Plummer is Dr. Parnassus, a trickster showman who travels through contemporary England, with a seemingly ramshackle show in which audience members step through a magical mirror into a surreal other world. 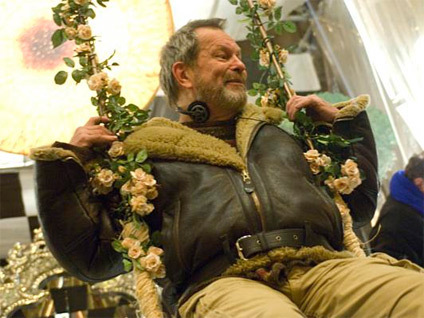 Gilliam discussed the unique adventure of making this movie, following a Museum of the Moving Image preview screening.